Antonio Morales (TheAthletic.com) — Saturday’s matchup between USC and Cal will be Joe Starkey’s 506th career broadcast as the voice of the Golden Bears’ football program. In his 44 seasons, Starkey’s called games when the band was out on the field, he’s chronicled the careers of many stars who’ve made their way through Berkeley, and has watched as the program posted two top-10 finishes in that time. All of that to say: Starkey has seen a lot. And a lot of time has passed since he called Cal’s upset of then-No. 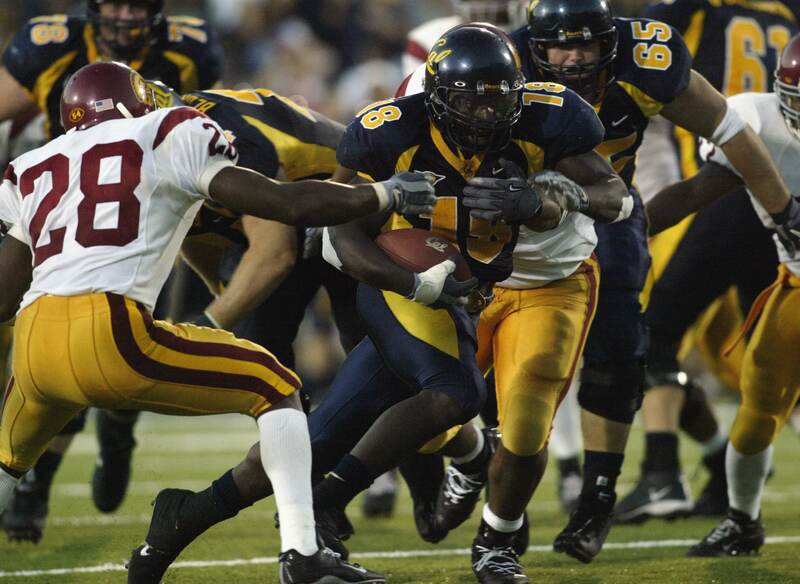 3 USC, 34-31 in triple overtime, on Sept. 27, 2003. It’s been 5,522 days to be exact. “It’s in the top five,” Starkey, who also served as the San Francisco 49ers’ play-by-play man for 20 seasons, answered when asked where that moment ranks in his career with Cal. “Several years ago, the sports information department, I can’t remember who but somebody asked me to pick the top-10 games I ever had the chance to broadcast and that game was definitely one of them. No ifs, ands, or buts about it. The Trojans haven’t given Starkey the privilege of calling another Golden Bears victory in the series since. Earlier this season, Kentucky snapped Florida’s 31-game winning streak in the two programs’ yearly series, which was the longest active FBS streak. Unofficially, because of a 2005 win vacated by NCAA penalty, USC’s 14-game winning streak over Cal is tied — with Virginia Tech against Virginia and Wisconsin against Minnesota — for the longest active win streak by one team against another in an annual FBS series. The Trojans have survived some close calls in that span, 2004 stands out, ‘07 was close, too. There have been some competitive games, like last season’s and some others, as well as some lopsided affairs. But for one reason or another, the games haven’t ended in Cal’s favor. A streak USC hopes to keep alive when the two programs meet Saturday night in the Los Angeles Memorial Coliseum (10:30 p.m. ET on ESPN). The Golden Bears (5-4, 2-4 Pac-12) are a five-point underdog against the Trojans (5-4, 2-3), but upset then-No. 15 Washington two weeks ago and pushed eighth-ranked Washington State to the limit last weekend. It feels like Cal’s best shot in a while at upending USC, which has been up and down this season and is banged up entering this week. Tom Holmoe resigned as Cal’s coach after a 1-10 season in 2001. Jeff Tedford took over shortly after and led the Golden Bears to a six-win improvement the following year, which included three road wins against ranked teams — Michigan State, Washington and Arizona State. But after a 2-3 start to the ‘03 season, Cal wasn’t really on the radar. And there wasn’t much expected against a USC team which was ranked third in the country, 3-0 at the time, riding an 11-game win streak and had won the Orange Bowl the season prior. See, the Golden Bears jumped out to an 18-point first-half lead against the Trojans the year before. USC eventually won, 30-28, to spark that 11-game winning streak but Cal had some confidence. And it had an edge to it. McArthur said Tedford was his usual self throughout the week, but when Steve Physioc, who handled play-by-play duties for Fox Sports Net’s television broadcast, met with Tedford earlier in the week, he could sense confidence. Cal entered the game with a starting quarterback, who was a juco transfer from Butte College and about to make his second career start. His name was Aaron Rodgers. Rodgers opened the Golden Bears’ first drive by tripping and falling on the very first play from scrimmage. He ended it with a 3-yard touchdown run. In between, Cal set the tone offensively with a precise passing attack and a strong running game powered by Adimchinobe Echemandu, who finished with 147 rushing yards that day. Back then, 147 rushing yards against USC felt like 300. The Trojans were notoriously strong against the run. The season before they didn’t allow a single 100-yard rusher. But Cal had the kryptonite. From 2002-04, a span of 36 games, USC gave up two 100-yard rushing performances and both came from Golden Bears running backs — Echemandu and J.J. Arrington, who rushed for 112 yards against the Trojans in 2004. The Trojans’ defensive line featured Cody and two future first-round picks, Mike Patterson and their current defensive line coach, Kenechi Udeze. But Cal’s offensive line did as well as, if not better than, anybody during that time of negating their impact. The mix of a strong offensive line performance, Rodgers, who completed 17 of 21 passes for 203 yards and two touchdowns in the first half, and Echemandu’s running kept USC’s defense off balance. Meanwhile, the Trojans’ offense was plagued by miscommunication, some missed throws by Matt Leinart, who was making just his fourth career start, drops, turnovers and the lack of a run game. The result was a 21-7 halftime deficit. receiver, now tight ends coach, Keary Colbert, who caught eight passes for 81 y “It happens all the time. We just started slow, found our rhythm late, put ourselves behind the eight-ball, said former USC ards and a touchdown that day. “We dug ourselves a hole and tried to dig ourselves out. Pete Carroll’s USC teams had a reputation for making timely second-half adjustments, which allowed them to pull away from opponents. The Trojans changed the outlook of the game in a 10-second span. After forcing a Cal punt, Lendale White capped a USC scoring drive, which was sparked by two Colbert catches, with a 6-yard scoring run. There was 7:26 left in the third quarter. On the very next play from scrimmage, Rodgers rolled to his right, evading pressure from a blitz, and threw an ill-advised pass, which was picked off and returned 26 yards for a touchdown by linebacker Lofa Tatupu. Rodgers injured his left knee in the first half but stayed in the game. But he couldn’t handle the injury much longer and exited the game after that interception. Cal went to Reggie Robertson, who had opened the season as the starter. Things would settle down a bit from there. The game remained tied at 21 as things shifted to the fourth quarter. Cal kicker Tyler Fredrickson nailed a 51-yard field goal to give the Golden Bears a 24-21 lead with 9:04 left, though. “You’re so focused when the game is going on,” Physioc said. “Well, at commercial break, I took my headset off and just look around that stadium and go, the whole environment there is just so beautiful, with Strawberry Hill, the pine trees, mainly that it was a beautiful evening. Cal opted to send Fredrickson out for another 51-yard attempt with about five minutes left in the game only for Cody, with some push from Tatupu, to block it. The Trojans marched to the Cal 14, and settled for a 33-yard field goal by Ryan Killeen with 16 seconds remaining, which set the stage for overtime. USC running back Hershel Dennis had found little running room in regulation, but opened the first overtime with a 20-yard run, which was promising until the very next play. Dennis took a handoff to the middle of the field where he was met by a Cal defender, who delivered a heavy blow and knocked the ball out in the process. The Golden Bears recovered at the 1. “We fumbled on the 1-yard line, Hershel Dennis, I’ll never forget it,” Udeze said. After two offensive plays, including a 14-yard run by Echemandu. Cal sent Fredrickson out for another field goal, this time for a much easier attempt of 29 yards, to win the game. Except this one was blocked too, by 6-foot-8 tight end Gregg Guenther, who also played on USC’s basketball team. “I’m like, “‘Oh no, not again,’” Starkey said. “We’re gonna win it. Cal’s going to get themselves an incredibly important victory over USC and they send a 6-foot-8 tight end, Gregg Guenther, into the air and he is able to knock the Fredrickson chip-shot, short-distance field goal. The two teams traded touchdowns in double overtime with Colbert tying the game, 31-31, on a 10-yard touchdown reception from Leinart. Then Fredrickson would find redemption. After Killeen missed a 39-yard attempt in the first half of triple overtime, Cal ran a few plays before sending Fredrickson out for the game-winning 38-yard attempt. Fredrickson’s attempt was good. USC’s winning streak was over. Then it was pandemonium. The upset wins in Tedford’s first year were noteworthy, but they didn’t compare to this. It was the Golden Bears’ first win against a top-five team since it beat the fourth-ranked Trojans in 1975. 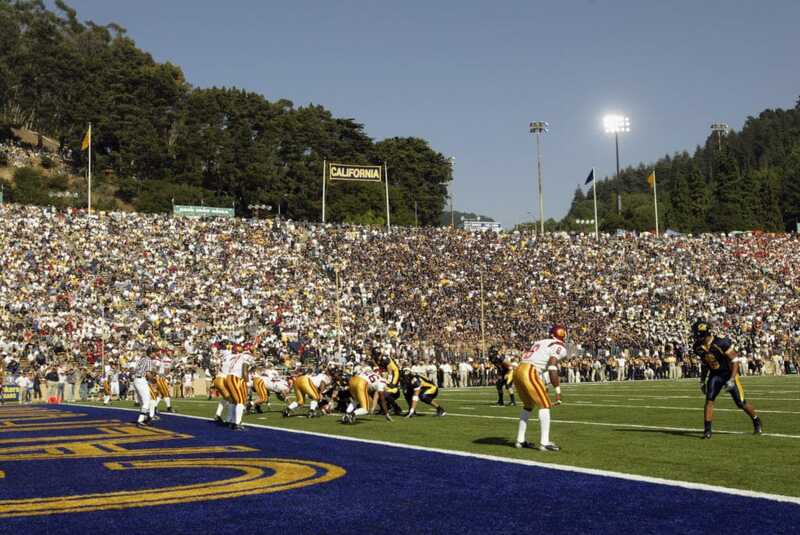 Cal finished 8-6 that season with a dramatic Insight Bowl win against Virginia Tech, which also ended with a Fredrickson game-winning field goal. But the victory against USC set things in motion for a 10-2 record and a top-finish the next year. The Trojans rebounded the next week with a win at Arizona State. It was a tie game at half, before USC pulled away and went on to win its next nine games that season by at least 14 points, which includes a Rose Bowl win against Michigan. The Trojans won 34 consecutive games after this loss. They were awarded the Associated Press national title in 2003, but the defeat ultimately kept USC out of the BCS title game. I too will not forget that game. About 5 of my buddies and I were in Lone Pine on a weekend trip and we watched that game in our motel room. I still recall pounding the floor after the Bears won it, thinking we had just blown a chance at the national championship. But without that defeat the team might not have been disciplined enough to win out and gain a piece of the national championship. So you never know where the gold is sometimes lying.